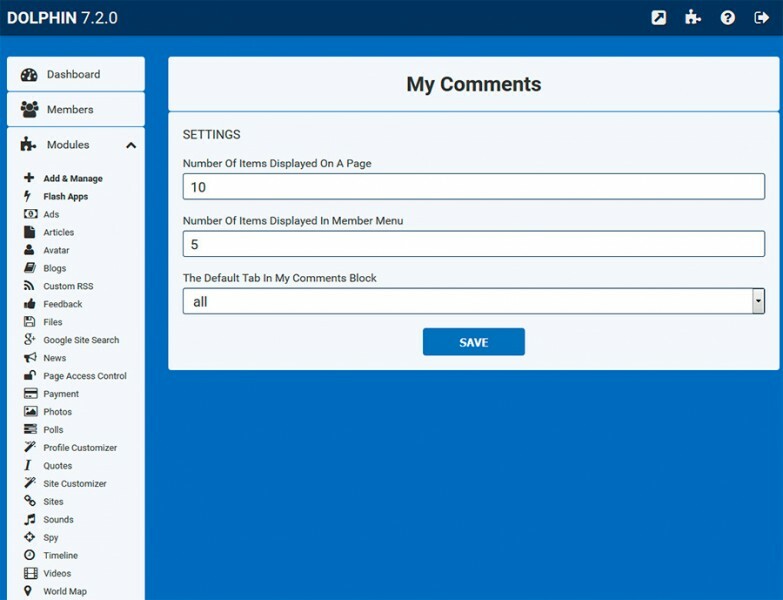 This module adds the possibility for your members to easily browse comments, which they received throughout your site, in one single place. 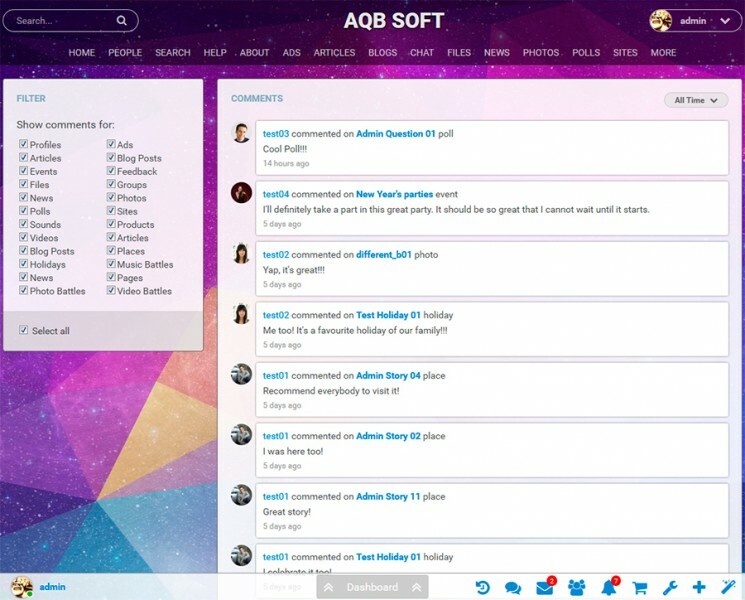 The most recent comments can be viewed via floating member menu -> 'What They Say' item (Image #1). My account page -> What They Say block (Image #1) allows to browse comments filtering by time (today, this week and all time comments). 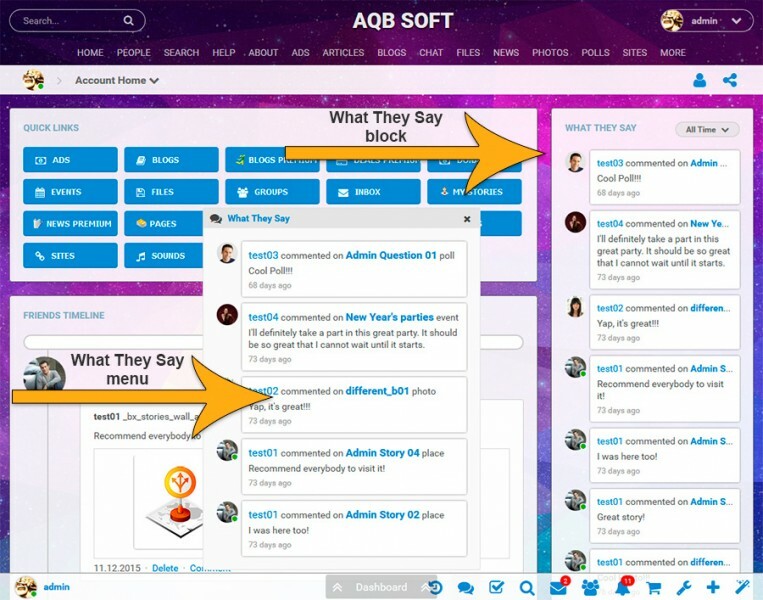 And finally What They Say page allows to browse comments by time (today, this week and all time comments) and by commented content type (photos, videos, events, groups, etc) (Image #2). Note. It doesn't matter when the module was installed before or after a comment was posted. 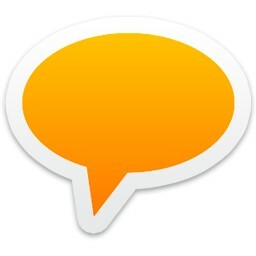 All comments (old and new) will be browsable in this module. The module was integrated with Dolphin's membership levels. Now you are able to activate/deactivate the possibility to check "What They Say" for necessary membership levels. This module works with default Dolphin's subscriptions - By default subscriptions are available for almost all content in Dolphin like photo, video, group, etc. The module adds the possibility for your members to easily browse subscriptions, which they received throughout your site in one single place. This module adds the possibility for your members to easily browse views, which they received throughout your site, in one single place. This module works with default Dolphin's votes feature - Star based rating which is available on all contant pages like photo, video, group, etc. It adds the possibility for your members to easily browse votes, which they received throughout your site (in photo, video, group, etc modules), in one single place. A pack which can help you to improve member's account functionaly with 25% discount. You may test our mods, plug-ins and modules on our demo sites Dolphin 7.2, Dolphin 7.1, Dolphin 7.0 and Dolphin 6.1. Also if you have some questions feel free to contact us.